Tempura restaurant outside the market. I spent my lunch hour for eating tempura at Tempura Kurokawa in Tsukiji the other day. Kurokawa’s lunch is gorgeous just a bit for my work lunch. They serve four courses and six species of tendon at lunchtime. I remember that I ate tempura course at Kurokawa a few years ago. It was good, too. But tempura course is served slowely. I have only 1 hour for lunchtime during work. So,I decided to eat tendon before leaving my office. Tempura Kurokawa is one of my longing restaurant in Tsukiji. It stand on the back alley of Tsukiji Outer Market from Harumi street. Kurokawa stand just in front of my favorite Motodane close to Kachidoki bridge. 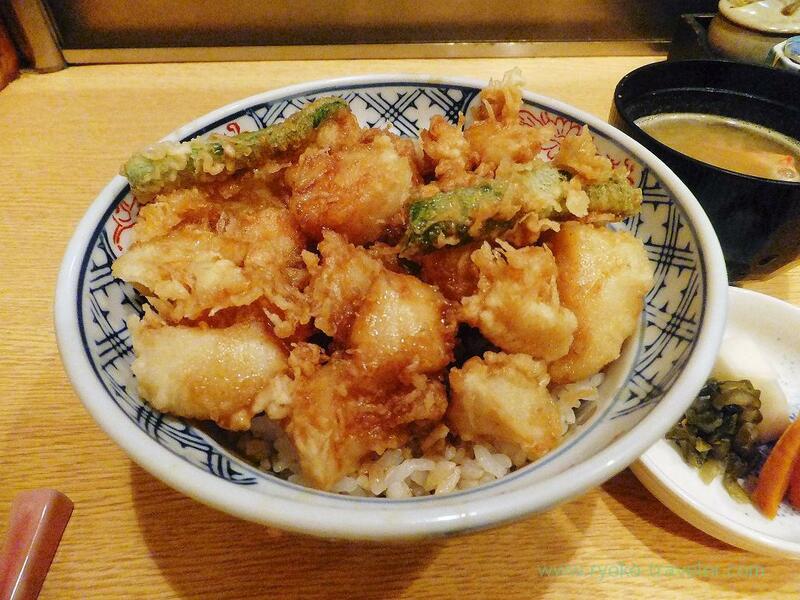 Speaking of tempura in Tsukiji, Tenfusa within the market is well-known. And Choseian that is soba restaurant serves good tempura. And this Kurokawa have high reputation, too ! I already visited all restaurants. Every restaurants are good. 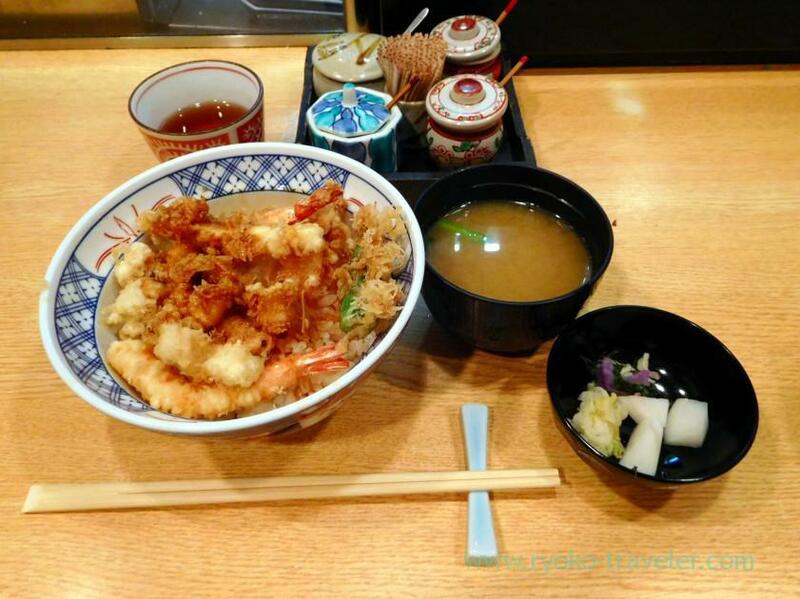 *Tenfusa is for people who want to eat tempura quickly at lower price inside Tsukiji Market. And Kurokawa is the most gracious, I think. Kurokawa is so small restaurant. There’re only four counter seats and two tables having four seats each. So, we have to share the tables during busy time. 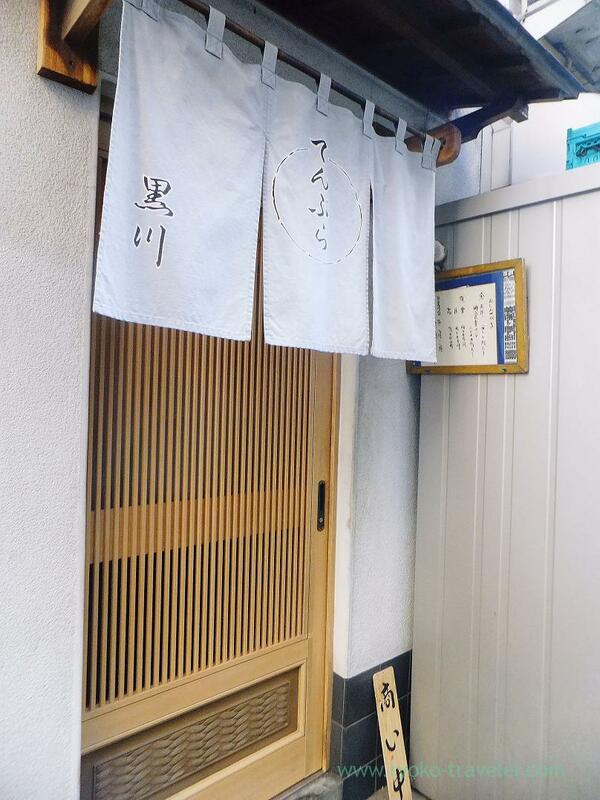 If you are seated at the counter seats, you can enjoy viewing the chef cooking tempura. 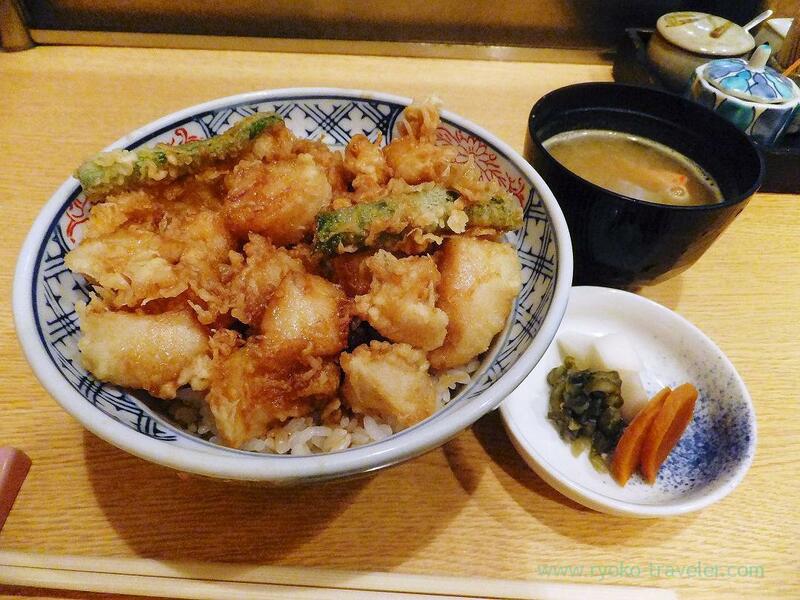 Kakiage bowl (1500 yen) is the most popular food at Kurokawa. Speaking of kakiage, it mostly have much vegetables (onion, carrots and so on) and few sakura shrimps. But Kurokawa’s kakiage isn’t so. It have much scallops ! And few sakura shrimps. There’s not much vegetables.They use sesami oils for cooking. It’s flavory. Those scallops were fried deeply and quickly, so those were medium rare and tasted very sweet. Its coating was crisp and the sauce wasn’t so sweet and greasy. That’s my tastes. And another day, I had Jyo Tendon (Special tendon, 1500 yen). “Jyo” means “superior”. But somehow “ordinary” isn’t on the menu. It was good as well as kakiage bowl. It have shrimp, conger eel and so on. Jyo tendon have assorted tempura. It had two shrimps, conger eel, scallop and so on. 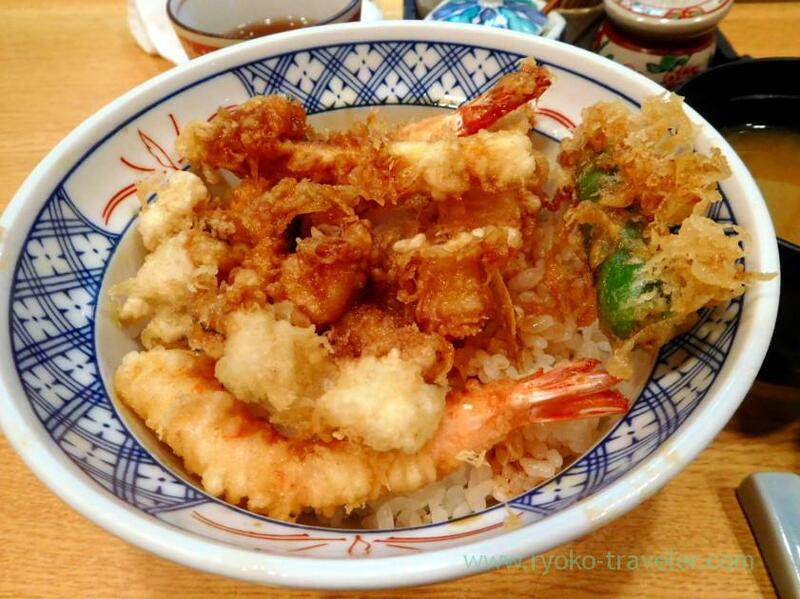 And if you can eat much, Kurokawa have Tokujyo tendon (Deluxe tendon / 特上天丼, 2000 yen) having more pieces of tempura in a big bowl. All tendon have miso soup and pickled vegetables. 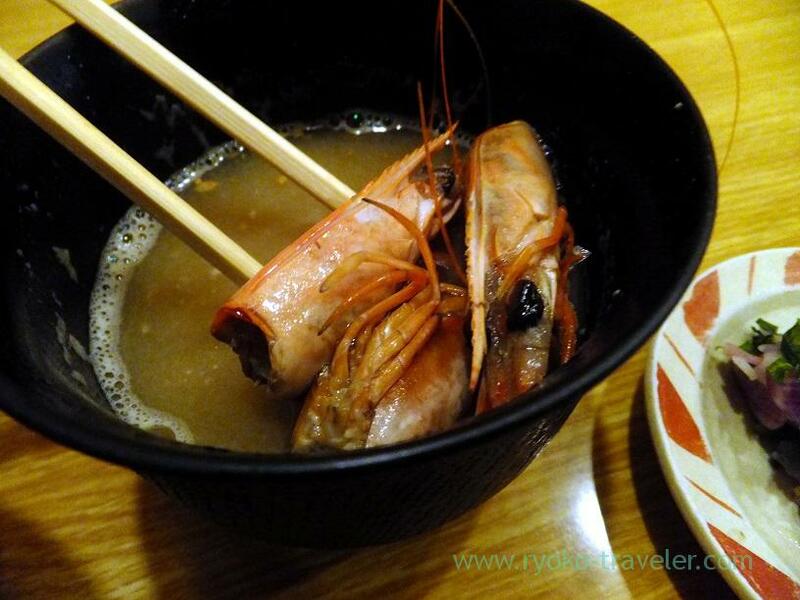 The soup have about three heads of shrimp. As I said now, it is so small restaurant and there’s no space to put large baggage. So, you have to leave your baggage outside if you come here with large baggage. So, you’d better come there without large baggage. And if you have bigger body, you might feel uncomfortable because the chairs and tables are small and intervals of seats are tidy. Counter seats is better than tables because intervals between seats are wider a bit. Open / 9 a.m. – 2 p.m. (reservation unavailable), 5 p.m. – 9 p.m (reservation only).